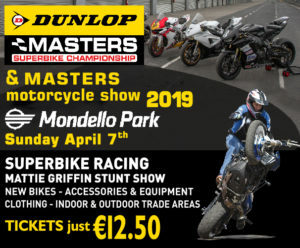 The 2018 Dunlop Masters Superbike Championship season opener, at Mondello Park on April 6th & 7th, will include the MastersMotorcycle Show. For the Sunday of Rounds 1, 2 & 3 a large part of the Mondello Park paddock will be taken over by our Motorcycle Show, which will include both indoor and outdoor exhibits. 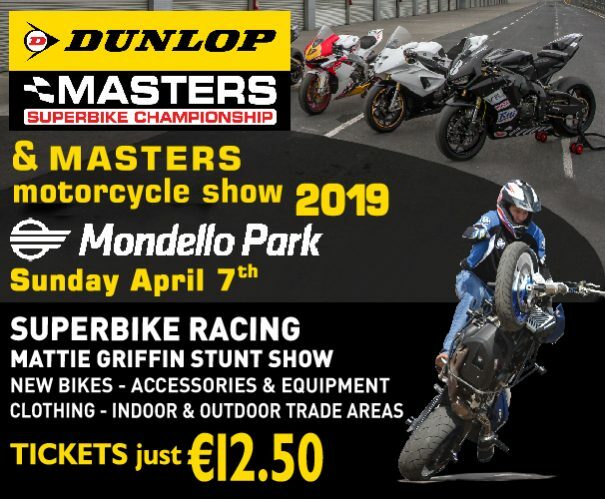 Access to the show area will be included in the Masters admission price which from Tuesday March 26th till Tuesday April 2nd will be available for just €10.00 making this event the most attractive ever Mondello Park event for fans of the Masters and motorcycling in general. Alongside rounds two and three of the Masters Superbike Championship additional motorcycle entertainment will be provided by the spectacular Mattie Griffin who will perform three times over the day in a dedicated area within the Mondello Park paddock. The paddock will also house displays of motorcycles from Yamaha, Triumph, Ducati, motorcycle shops, Masters Superbike Championship partner Principal Insurance along with a wide variety of Motorcycle related traders and service providers. Tickets can be purchased on-line (see button below) at the discounted price of just €10.00 from Tuesday March 26th to Tuesday April 2nd, From Wednesday March 3rd tickets will revert to €12.50 on-line.